No trip to Zimbabwe is complete without a visit to Victoria Falls. This country also has one of Africa's finest and largest concentrations of wildlife, and your Zimbabwe safari holiday needn't be confined to a Land Rover. Explore on foot, or take to the Zambezi in a canoe. Zimbabwe began life after independence in 1980, with one of the best transport and communication infrastructures in Africa, a solid industrial base, a thriving tourism industry, and with towns and cities that were ordered, safe and well maintained. While this is manifestly no longer the case as a result of the country’s troubled political and economic woes in the last decade or so, Zimbabwe still has well-protected national parks and a network of lodges and hotels that, even in the midst of the crisis, offer world-class standards of accommodation and service. A side-effect is that mass-tourism is not present, unlike other parts of Africa. The country’s principal attraction, however, is its natural environment. No visit to Zimbabwe is complete without seeing the Victoria Falls, where the mighty Zambezi spills dramatically into the Batoka Gorge. The energy and power of an almost 2-km-wide body of water crashing into the gorge 100 m below is a truly spectacular sight. 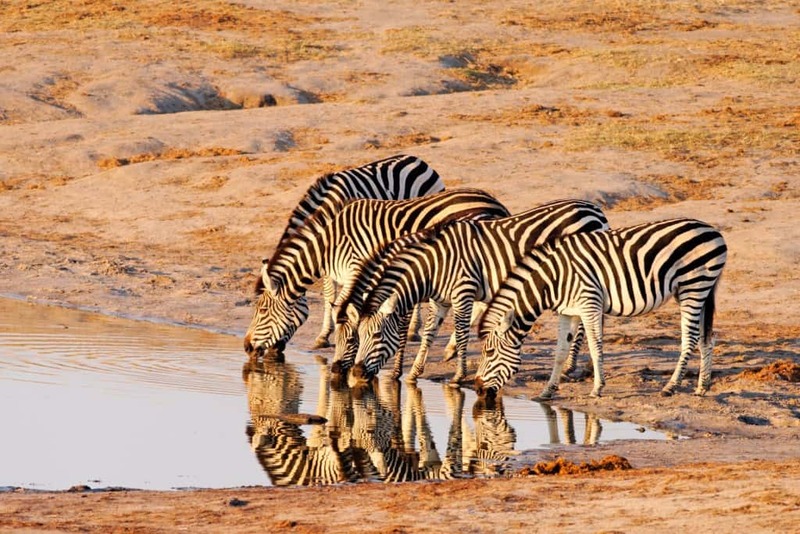 The country offers one of the African continent’s finest and largest concentrations of wildlife – most people visit in pursuit of the Big Five – and more than 11% of Zimbabwe’s land has been set aside as parks and game reserves. Zimbabwe’s largest national park, Hwange, covers the easternmost edge of the Kalahari and is home to a staggering 75,000 elephants. Whilst the journey may be rough on the parks’ bumpy and slippery roads, there is a wide range of locations in which to watch game. And you are not confined to the back of Land Rover; walking, horse riding, canoeing and even elephant-back safaris are all on offer.